A fascinating creature. Spiders, sharks, snakes, all predators, I love them all. What is the species? Do you feed it sometimes? Funny but I think I have seen such colours on a spider in Poland once. It must be international species. They are quite large, but harmless, unless you are an insect. They are called Garden Spiders and are beneficial to killing the insects that eat your plants. This was from our vacation in August. 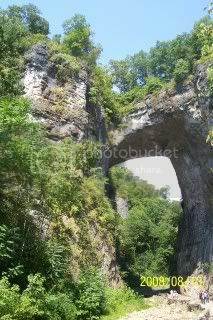 It's the Natural Bridge in Virginia. If you look close at the bottom right you will see people, to give you an idea of the size. There is a small creek that runs to the left of the people. Millions of years ago the creek started to cut through this rock. You can see the amazing results today. It's something to see in person! Great photos, Mary! I really like that rainbow photo too, and the Natural Bridge is incredible! Can you actually walk across it? Thanks Gigi, I'm glad you enjoyed them! Actually you aren't allowed on top of the rock. But there is a trail that takes you to the bottom and then you can walk along side the creek and go under the bridge. Keep walking and there is a native indian village where they show how they lived in the area many years ago. Go a lot farther and there is a waterfall but unfortunatly with two kids along we didn't walk that far. Maybe when they get bigger. why do you think the cruise boat is called Maid of the Mist? btw. most of the niagara water is actually diverted and only a small fraction falls over. spider: i have those in my yard too. they are pretty big. The Maid of the Mist is a boat tour of Niagara Falls. (The actual boats used are each named Maid of the Mist, followed by a different Roman numeral in each case.) The boat starts off at a calm part of the Niagara River, near the Rainbow Bridge, and takes its passengers past the American and Bridal Veil Falls, then into the dense mist of spray inside the curve of the Horseshoe Falls. The tour is available starting from either the Canadian or U.S. side of the river, returning to the starting point in each case. All passengers receive a blue Maid of the Mist poncho. The first Maid of the Mist was launched in 1846 as a ferry service between the Canadian and American sides, pre-dating by two years the construction of the first suspension bridge at the site. However, with the opening of the Whirlpool Rapids Bridge further downriver in 1848, the ferry service lost business, and by 1854, became a tourist attraction instead with the launch of a more luxurious boat. While on his 1860 tour of Canada, Prince Albert Edward, Prince of Wales (later King Edward VII), rode on the Maid of the Mist. Financial difficulties and the impending American Civil War forced the boat to be sold to a Montreal firm in 1860, and formal service was not restored until 1893, when two new boats were constructed and launched under a new partnership, Maid of the Mist Steamboat Company. These boats sailed the lower river until April 22, 1955, when they burned in a pre-season accident. Later that year, they would be replaced by the type and style of boat still seen today. The Maid of the Mist is well known for its role in the July 9, 1960, rescue of Roger Woodward, a seven-year old boy who became the first person to survive a plunge over the Horseshoe Falls with nothing but a life jacket. The boat involved in the rescue (known as Maid II) was retired from service in 1983 and relocated to the Amazon River, where it served as a missionary ship for years after. Access to the river-level attraction on the United States side was provided by the Maid of the Mist Incline Railway, a funicular railway, between 1894 and 1991 to travel between street level and the boat dock. As this service proved increasingly inadequate in transporting the growing passenger base of the 1990s, four high-speed elevators replaced the railway by the start of the 1991 tourist season. On the Canadian side, the dock is reached by elevators enclosed in the gorge wall. The same year, Prince Charles, Prince of Wales, Diana, Princess of Wales, and their two sons, Princes William and Henry, rode on the Maid of the Mist. A partial history of the Maid of the Mist is featured in the IMAX film Niagara: Miracles, Myths and Magic. I did not see my name on the list, I also took this trip twice, and I am a world leader. I can imagine. Everything American is bigger than in Europe. Grammyk, thanks for the photos! This bird, grosbeak is the name I believe, has flown into the window today and hit the glass. After half an hour spent in my hand and then another two in the shoe-box under some cotton, still in coma, it has eventually woke up. 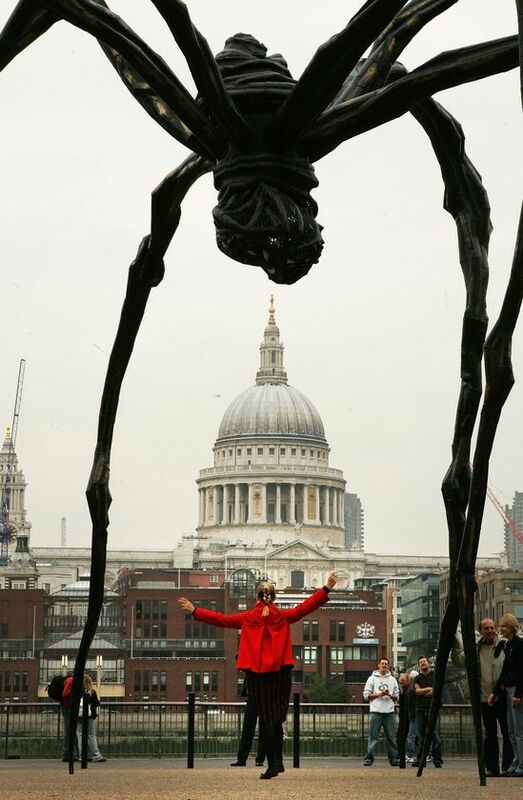 We put him on the terrace - see the photograph, where it stood for another 5 minutes. And then flew away. Neat picture of the bird. Where are you located? It doesn't look like the grossbeaks we have here. But I could be wrong. Maybe it's a young one and hasn't gotten the distinguished colors yet. Here the adults are rather large, bigger than robins. Was yours that big or smaller? At any rate it's a very good close up picture! I like the story as much as I do the photo! I have rescued many similarly stunned birds in my time and put them in the shoe-box hospital. I also still carry bugs outside to freedom. Yesterday I rescued an incredibly big cricket in my basement and a very thin-legged little spider in my kitchen. Only flies and mosquitoes are exempt from this treatment. We went on the annual "leaf looking" ride this afternoon. I wasn't able to get many shots because dear hubby doesn't like to stop and I refuse to shoot pictures through the windshield. 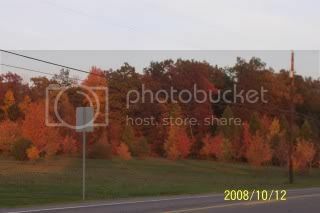 However, just 1/2 mile before our driveway he pulled over and I got a pix of some trees with the last of the sun on it. (I think I can get a better shot tomorrow, it was a bit too dark. And earlier I got a nice shot from my porch of the trees along the driveway. We might have another week or two (if lucky) of the brilliant colors before they are gone. So maybe the proper English name would be a hawfinch. Or just European grosbeak. It was certainly young one, from this year - thus the accident. Plus his feathers were is mess. They are much smaller than the robins, just a little bigger than a sparrow. I am located in Poland, near Warsaw. I also still carry bugs outside to freedom. Most of our brightest colors are from the Maple trees. We also have a lot of Oak and Cherry. How about you? Maple, oak, horse chestnut, rowan and ... creepers. And staghorn sumac, imported tree getting very popular. Love them all but my favorite is with the winding road, the 5th one. That was my favorite too! But of course who can resist that adorable fire truck??? Thanks for sharing the photos, Tufta. 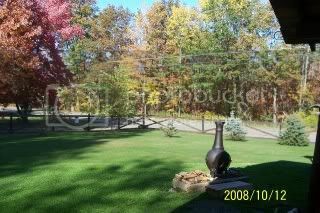 Beautiful pictures, Tufta, and we have a vine around here known as 'Virginia Creeper' which looks just like your creeper! I've checked in the encyclopedia, it really seems exactly the same. Now, I wonder what continent was native to the plant. hmm...I wonder too, but couldn't it be native to both just like maples and oaks are? there are 15 varieties of this plant from asia to eu to n. america. the one in tufta's pic definitely looks like VA one but i am sure it's not unless it was transplanted somehow/sometime. i highly doubt it. and i don't recall VA creeper having fruit but it may have it. oh i looked into it and seems that VA Cr. is in EU. must have been transplanted sometime in the past. seems the english blokes like their exotic gardens. Parthenocissus vitacea - is a false va creeper and maybe one of the ones in PL. seems some are exclusive to NA and some to EUAsia.